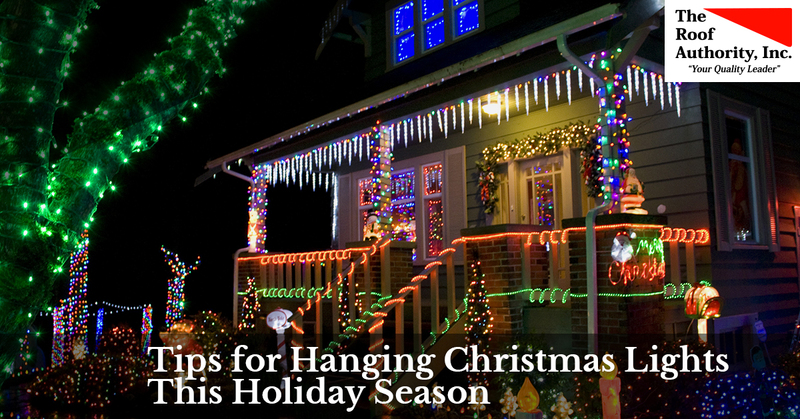 Now is the time of year when many of us are climbing up on our roofs to hang Christmas lights, and if you’re like most people, you want everything to look fantastic. There are some things to keep in mind to get the best-looking lights in the neighborhood, so read on to learn more! We at The Roof Authority are proud to have served the Fort Pierce and surrounding areas since 1993. When you’re in need of roof repair or replacement, contact us now. The Roof Authority is your trusted residential roofer. Call us now! Here are some tips to make installing your holiday lights easier and safer. Before we get into the nitty-gritty, let’s get this out of the way first: safety is your top priority. Here are a few things to keep in mind. Only use lights and extension cords rated for outdoor use. They’re more durable and able to keep out moisture for your safety. Never hang lights or use cords that are frayed or damaged. When you’re up on the ladder, make sure you have a spotter to hold the ladder steady, hand you tools, and to help you with placement. Never stand on the top of the ladder, and never reach—it’s always safest to move it over. Buy insulated tacks to attach the lights to your home, or a product that’s designed just for hanging lights. Christmas lights are so much more than a single string of single-colored lights! There are strands that change color and blink, yes. And you can find lighted balls, screens, woven “sheets” you can drape over greenery, and so much more. Have fun with it! Take into consideration everything you have, then draw a rough sketch of your home and the areas you’re going to decorate. Knowing ahead of time where everything should go will make things go smoother, and also make for a more cohesive design. Check the Lights…Before You Hang Them! After you’ve already spent hours untangling strands of lights, planning your design, and assembling other equipment, you owe it to yourself to check the lights before they go up. Do you really want to spend hours hanging them, only to find the strand no longer works? Or that a bunch of lights have died? We’re going to be the answer to that is no. Thoroughly test and inspect each piece you’re using ahead of time (and of course look for safety hazards!). Ready to light things up? Now’s the time! Work your way around your home. You might find that it’s easier to start up high and work your way down, or vice versa. One thing we’d like you to do while you’re up on the ladder is take a look at your shingles and roof. Take note of any damage you see, and be sure to give us a call so we can take care of it. Even small damage can cause a hike in your energy costs, or allow moisture to come in and cause mold and decay. Neither are good, so it’s best to fix things while they’re minor. Step back, fill up your eggnog cup, and take a few moments to admire your work. Snap a few photos, share the memories, and enjoy your holiday season. For the best roofing contractors in the area, contact The Roof Authority now. We are a commercial and residential roofer who can take care of roof repair, maintenance, and installation. Call us now!